Join us on the 28th March for an evening filled with award winning beer and outstanding matched food. We will be joined by the guys from 2 of the UKs leading breweries, Tiny Rebel & Roosters, as well as Michelin starred Chef Director Luke Tipping and Purecraft Bar & Kitchens own Superstar Chef Steve Woods. 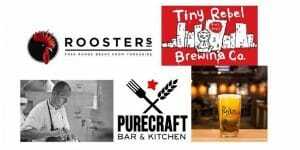 The evening will be hosted by Purity Brewing Companys Paul Halsey where you will get to try 6 different beers and eat 4 expertly matched dishes, whilst Tom (Roosters) and Ryan (Tiny Rebel) tell you about how they brew the beer and the stories behind each brew. Tickets are available in the bar, over the phone (01212375666) or click here.